On texts adapted from the liturgy. • World premiere: 17/06/2005, basilique royale, Saint-Denis (France) – Thierry Escaich (organ), Bertrand Chamayou (piano), Emmanuel Curt & Florent Jodelet (percussion), ensemble Sequenza 9.3, Catherine Simonpietri (cond.). • Scoring: at least 12 voices (SSSAAATTTBBB), organ, piano, percussion. • Commissioned by ensemble Sequenza 9.3 and Festival de Saint-Denis. 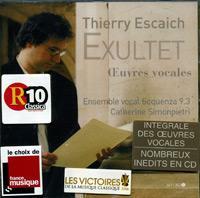 • CD “Exultet” (Accord/Universal 476 9074). Recorded at Saint-Etienne-du-Mont Church, Paris, in March 2006.